Pop quiz: Where was the first ciclovia? I bet you said Bogotá. But, surprisingly, you’d be wrong. 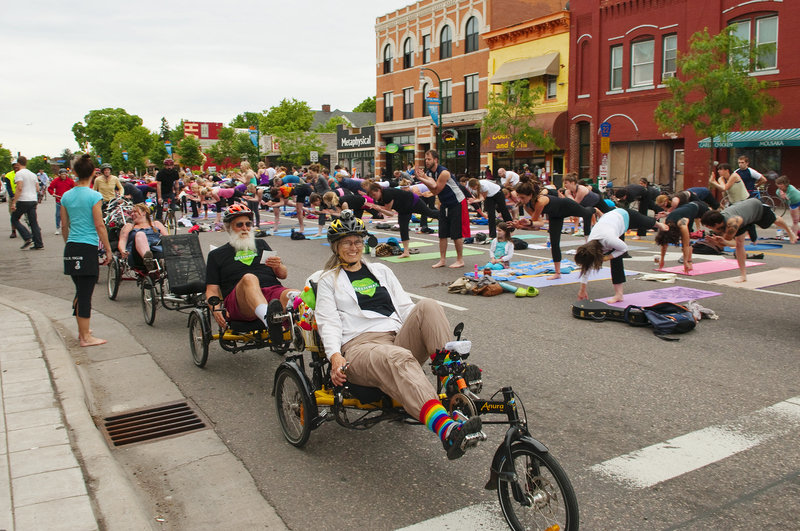 An open streets initiative in Minneapolis. Photo credit: Bethany Heemyer. Sure, the Colombian city is widely credited with popularizing the concept of ciclovias, which temporarily close streets to cars to liberate the roads for people. For several hours every Sunday, more than a million citizens in Bogotá take advantage of 70 miles of car-free streets to bike, walk, dance and participate in a variety of creative non-motorized activities. But while South America has certainly set the standard for ciclovias — or open streets — around the globe, it wasn’t the birthplace. Starting as early as 1965, open streets initiatives in Seattle, New York City and San Francisco pre-dated Colombia by nearly a decade. In fact, North American cities have played a significant role in the open streets movement and, in the past six years alone, the number of initiatives has grown from 11 in 2005 to more than 70 in 2011. To keep those numbers ticking up and to make current initiatives even better, the Alliance for Biking & Walking and the Street Plans Collaborative just released a new resource that highlights examples and compiles best practices from 67 initiatives from across the continent. The Open Streets Guide, released last week, features an introduction to open streets, a summary of the initiatives in North America and case studies of 67 initiatives from across the continent. The guide breaks down U.S. and Canadian initiatives into seven model types, based on how they’re funded and who’s in charge, and zeroes in on best practices taken from initiatives in North and South America. It also includes some fascinating statistics, like average route length (3.95 miles), population served (28 percent of open streets occur in cities of less than 100,000 people) and funding (52 percent of open streets initiatives are paid for by a public-private partnership). The guide groups open streets projects by a few dominant models. For example, Seattle’s Bicycle Sunday, the longest-running open streets project in North America, first set the example of a parkway ride in 1965 with its three-mile stretch of car-free roadway on Lake Washington Boulevard. It took until 2006 for the model of an unstructured, open event to be revolutionized — and it was the city of Cleveland that did it, by instituting programmed activities in the streets. Kentucky made open streets history in 2008 with its public/private Second Sunday program explicitly aimed at combating the state’s obesity epidemic. (It’s the fifth-fattest state in the union.) San Francisco’s “People’s Day in the Park” was kind of a dud for the first ten years of its existence, until roller skate vendors opened up in 1977, turning the weekly event into a skaters’ paradise. And if you’ve ever been to a reclaimed-street event, you know they’re boisterous times, but Phoenix calls its car-free park program “Silent Sundays” in honor of the quieting of automobile noise. The guide is an initiative of the Open Streets Project, which was born in 2010 when Mike Lydon, a principal at the Street Plans Collaborative, recognized the skyrocketing popularity of open streets initiatives and the lack of resources on how to pull them off. So the firm set out to create a clearinghouse of information and best practices that could educate and inspire organizers of all stripes. In partnership with the Alliance for Biking & Walking, the Collaborative launched the Open Streets Project last year with an interactive website which showcases more than 70 current initiatives, from Miami to Missoula, Los Angeles to Ottawa. It includes organizational information on routes, financing and frequency and also provides real-world templates for event logistics, like volunteer recruitment and branding. Looking to organize a monthly event in a West Coast city of less than 50,000 people? There’s an open streets example for that. Just plug the characteristics of your city or event into the search engine. The Open Streets Guide, the latest collaboration between the Alliance and the Open Streets Project, is available for a free, electronic download here. And if your city or organization has information to share about an open streets initiative in your community, contact Mike Samuelson, Alliance Open Streets Coordinator, at (202) 449-9692 x7 or mike@PeoplePoweredMovement.org. Carolyn Szczepanski is the communications coordinator for the Alliance for Biking & Walking. It is very cool, but it may not be suitable for people to use it as a often-used vehicle. That report lists Memorial Drive in Cambridge, Mass. as being a Sunday-closure street starting in 2004. I really don’t care who was the first, but this is a great idea that has actually been around a long time.